8-9 November 2014 with an estimate of Swiss Francs 250,000-350,000 (US$ 265,000-370,000). Lot 861 is the third example of a limited edition of 30 pieces whose production started in 1991. 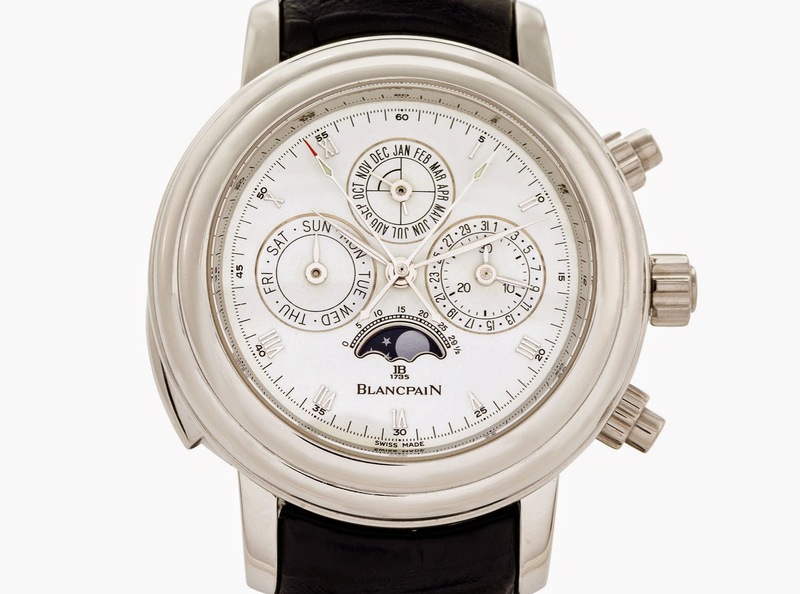 One of our favorite Grande Complicationa timepiece ever produced, the Blancpain 1735 Grande Complication features a one-minute tourbillon regulator, a perpetual calendar with moon phases and moon age, a co-axial split seconds chronograph and a minute repeater activated by the slide on the band. The platinum case has a size of 42 mm and a total thickness of 17 mm. The Calibre 1735 movement is visible through the sapphire crystal case back revealing hand-engraved plates and bridges, a skeletonized and hand-engraved platinum rotor and excellent finishes. 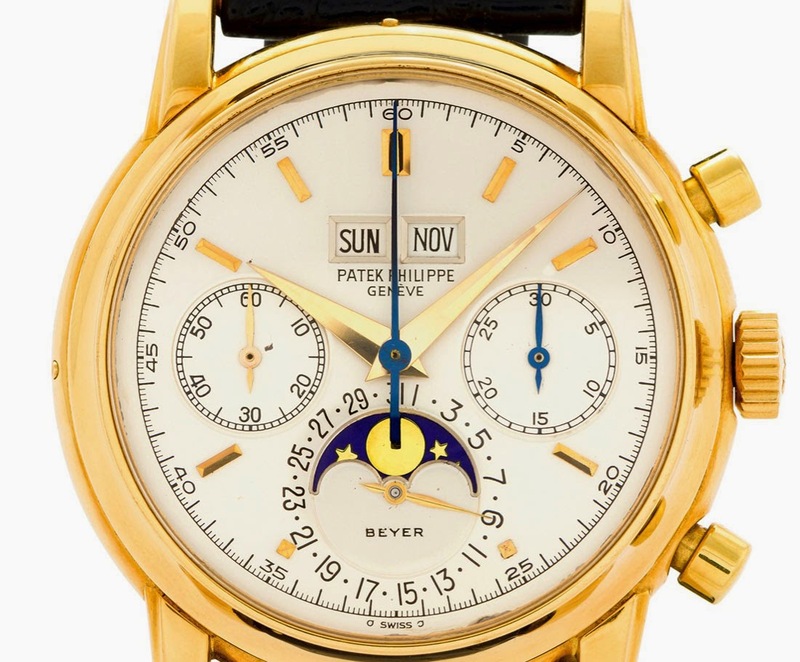 Another outstanding highlight of the auction is the Patek Philippe Ref. 2499, Third Series retailed by Beyer (Zurich) as signed on the silver dial (lot 992). 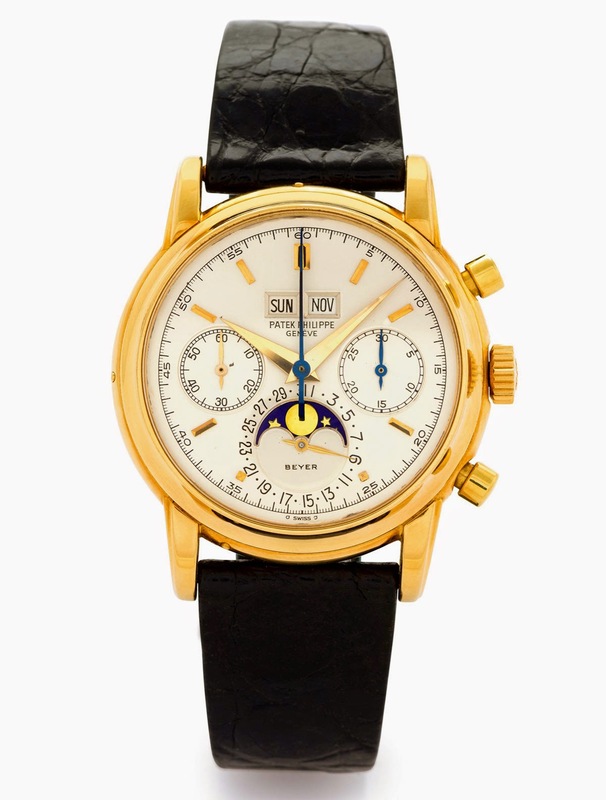 Sold in 1981 and from the property of the original owner, this example has a yellow gold case with a diameter of 38 mm and a thickness of 13 mm and features a round button chronograph with 30-minute register as well as a perpetual calendar with moon phases. Reference 2499 was produced in 349 examples from 1951 to 1985 in four series. The third series was produced from 1960 to 1980. 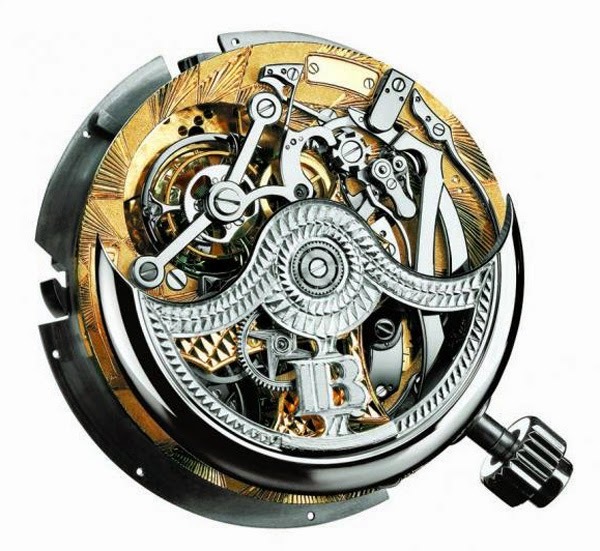 The auction estimate for this wristwatch is Swiss Francs 250,000-350,000 (US$ 265,000-370,000). 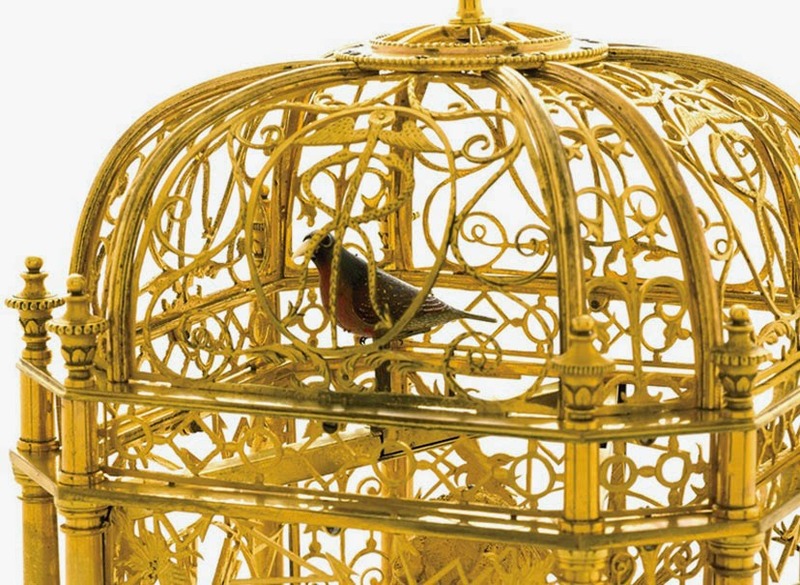 A remarkable lot of this upcoming auction is also the Singing Bird Cage Clock with Automaton Jumping Bird and Automaton Waterfall attributed to Jaquet-Droz et Leschot Geneva (lot 578). Made circa 1785, this is an extremely fine and small (22.3 x 11.4 x 11.4 cm), gilded-brass, automaton singing bird clock with a finely painted bird with automated beak, wings, tail and an automaton waterfall activated at will and by the clock every three hours. The bird is operated by a system of chains running up a tube on the back panel of the cage and into the fast-moving pivoted arm supporting the bird which allows jumping from perch to perch during activation. The white enamel dial features Arabic numerals with an outer minute track, blued steel Breguet hands and a winding aperture below 12 o`clock. The estimate for this rare clock is Swiss Francs 200,000-400,000 (US$ 209,000-420,000). 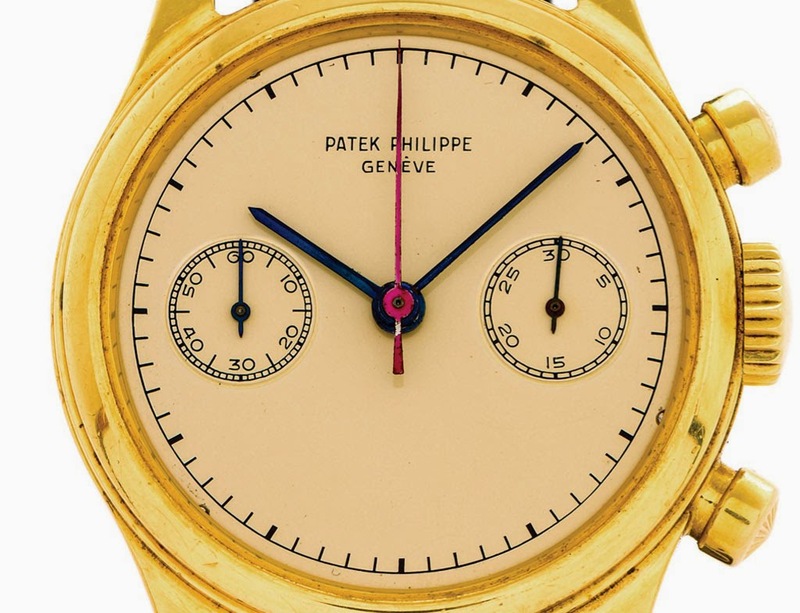 Another timepiece that grabbed our attention is lot 983: the Patek Philippe Ref. 1463 "Without Indexes and Timing Scale". 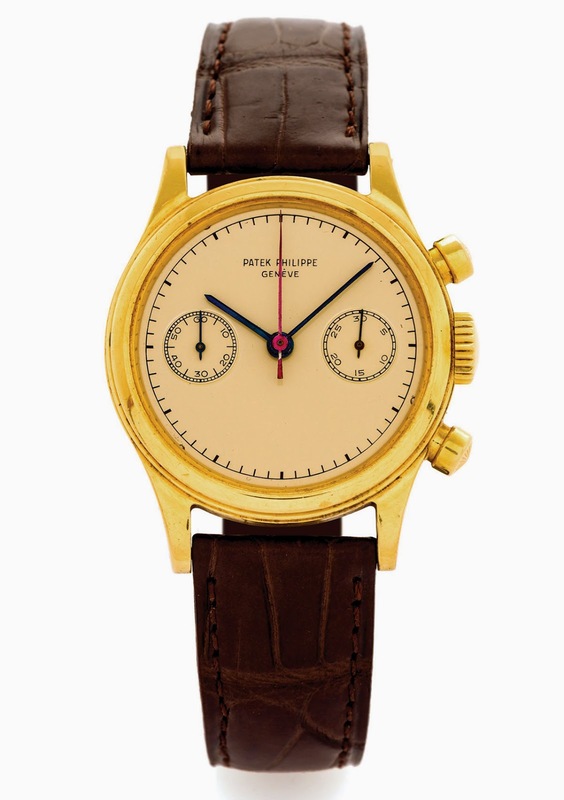 Made in 1956, this two-register chronograph has a yellow gold case with a diameter of 35 mm and is characterised by a possibly unique dial with neither indexes nor numerals and also without a timing scale of any description. There are several variations of dial for the reference 1463 including dials with tachometer, pulsometer and asthmometer so this dial could be an un-adopted design or trial piece. Estimate: Swiss Francs 100,000-150,000 (US$ 105-157,000). 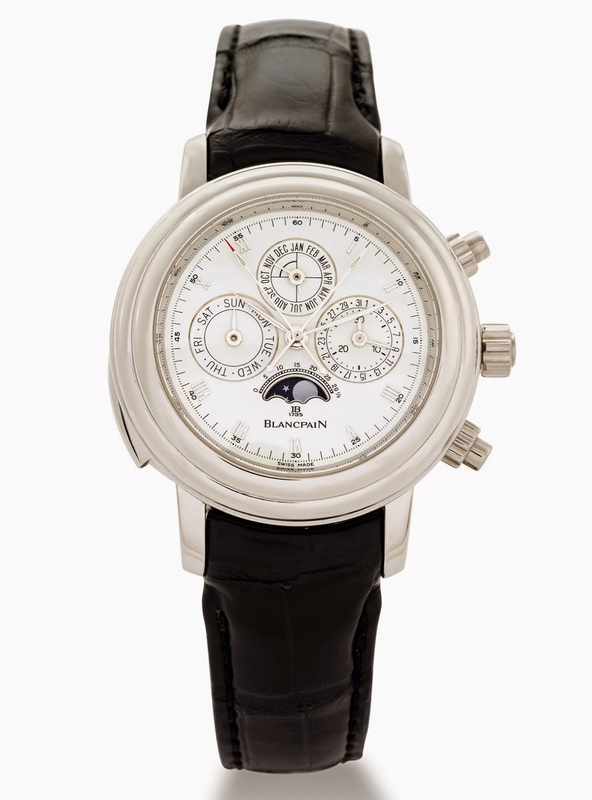 A rare Blancpain 1735 Grande Complication will be on sale at Antiquorum Geneva on 8-9 November 2014 with an estimate of 250,000-350,000 Swiss Francs (US$ 265,000-370,000). This timepiece - identified as lot 861 - is the third example of a limited edition of 30 pieces whose production started in 1991. 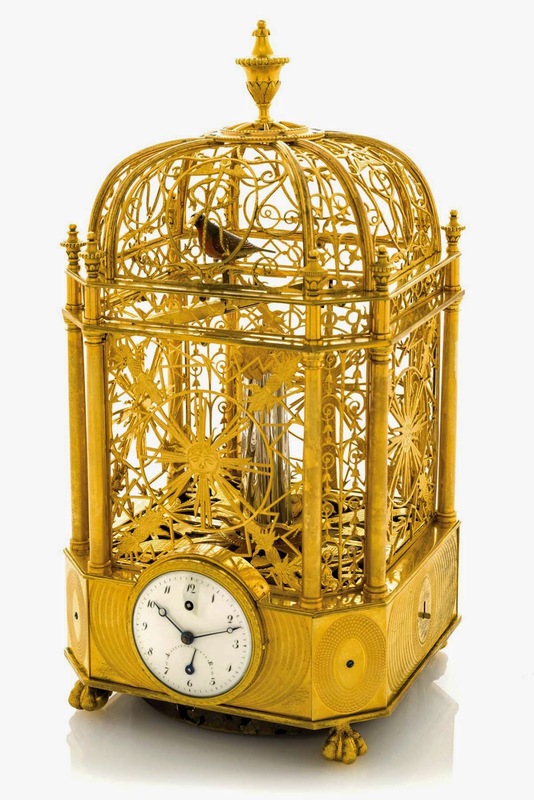 A remarkable lot of this upcoming auction is also the Singing Bird Cage Clock with Automaton Jumping Bird and Automaton Waterfall attributed to Jaquet-Droz et Leschot Geneva (lot 578).